Discover how we make renting a dumpster in Gwinnett County, GA a simple and easy process. 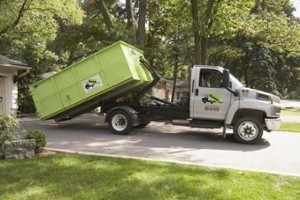 Bin There Dump That is committed to making the dumpster rental process for the customer a seamless transaction, from placing an order for the needed dumpster size to delivery of the waste container in Gwinnett County to an immediate pick up when you no longer need the bin on your driveway. No, you won’t need permit if you rent a dumpster and place it on your own property, such as your driveway. If you want to place it on public property, such as your street, some municipalities require a permit. If you’re worried about damaging your driveway, fear not. 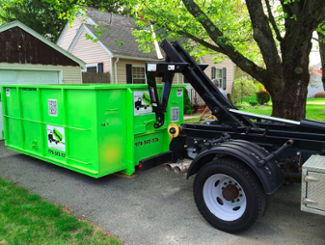 At Bin There Dump That, we pride ourselves in being the residential friendly dumpster company and that includes protecting your driveway from any damages that may occur during your project. We place special wooden planks on your driveway before we unload the dumpster to act as a guard. If you’re worried about the aftermath, don’t! We sweep up any debris that may have fallen during your project and as well a metal sweep to pick up any dangerous metals. And you know what’s best? This is all included in the price of your dumpster rental. Book now to find out more! Early in Gwinnett County’s history, gold mining was a minor industry. The Gwinnett Manufacturing Company, a cotton textile factory, operated in Lawrenceville in the 1850s through 1865, when it burned. The Bona Allen Company in Buford, Georgia produced saddles, harnesses and other leather goods from 1873 to 1981. Sports play a large role in the county’s recent history. Minor-league affiliates of the NHL Boston Bruins, and the MLB Atlanta Braves play home games and talent scout in the area.In 2016, the Georgia Swarm of the National Lacrosse League relocated from Minnesota and began playing games at Infinite Energy Arena. The team won the league championship in 2017.Georgia Force of Arena Football League had also played at Arena at Gwinnett Center before the team folded in 2012. Gwinnett also hosts the Gwinnett Lions Rugby Football Club, a Division 3 Men's Rugby Team competing in the Georgia Rugby Union. The rap group Migos hails from Gwinnett County. Migos won the 2015 YouTube Music Award, as well as several other notable entertainment television awards. Strange Music artist Rittz also hails from Gwinnett County. Child star MattyB, who currently has over 9 million YouTube subscribers for his rap songs and vlogs, was born in Duluth in Gwinnett County. He now resides in Suwanee with his family. Visitors to the Gwinnett County area have many options for fun and recreation. Some local favorites are Netherworld Haunted House, BAPS Shri Swaminarayan Mandir - Hindue Temple, Southeastern Railway, Little Mulberry Park, Jones Bridge Park, Stone Mountain Park, Tribble MIll Park, and Stone Mountain Park. Your local Dumpster Rental Experts in Gwinnett County dumpster rental operators are Kevin & Jessica Stearns.